Lock in a great price for Sunprime C-Lounge - Adult Only – rated 8.8 by recent guests! Very nice hotel right at the front line. The room is well equipped with everything you need. The hotel has a necessary facilities such as pool, gym, spa area. The food is amazing and there is quite good variety so you don't get bored. Everyone from the staff was kind and hospitable. Very Kind Friendly and Professional Staff More than Delicious Food With Lots of Options Nice Restaurant Nice Spa. Clean and comfortable hotel. Foods are very good, many choices with different taste. No children around, adult only hotel. All rooms have balcony. Great hotel. Food was great, amenities, friendly staff. The staff was exceptional and very welcoming. The gym was very nice as well. The food here outlived our expectations and there was a good variety between greens and meat. Stayed here with a group of friends and all in all had quite a nice stay! The staff was very friendly and helpful. The hotel very cozy. I have visited Turkey many times and this is by far my favourite hotel! It’s beautiful, modern and clean. The staff are warm and welcoming. The bed is super comfortable. The food is fresh, tasty and varied. Special thanks to Ali in the lobby bar for his cocktails and Cynthia for her Turkish massage-I’ll be back! The hotel is clean and new, just by the beach. The food is tasty and most of the staff members are very nice. The premises are quite new, the pool has music on, you can listen to when you keep your head under water. The sea is nearby. The hotel is excellent, location, comfortable, clean and perfect food. I recommend this hotel if you are looking perfect one! It’s only for adults which is extra plus good. Staff and accommodation were above ecpectation. Close proximity to the beach. Sunprime C-Lounge - Adult Only This rating is a reflection of how the property compares to the industry standard when it comes to price, facilities and services available. It's based on a self-evaluation by the property. Use this rating to help choose your stay! One of our top picks in Alanya.Featuring free WiFi, a spa center, indoor pool and a seasonal outdoor pool, Sunprime C-Lounge - Adult Only offers accommodations in Alanya. The hotel has a sauna and fitness center, and guests can enjoy a meal at the restaurant. All rooms include a flat-screen TV with satellite channels. Some rooms include a seating area where you can relax. You will find a coffee machine in the room. Every room is fitted with a private bathroom. For your comfort, you will find bath robes and slippers. There is a 24-hour front desk, concierge service and hairdresser's at the property. This hotel has a private beach area and bike hire is available. Car hire is available at this hotel and the area is popular for cycling. Alanya Ataturk Square is 2.5 mi from Sunprime C-Lounge - Adult Only, while Alanya Red Tower is 2.6 mi from the property. The nearest airport is Gazipasa Airport, 21 mi from Sunprime C-Lounge - Adult Only. When would you like to stay at Sunprime C-Lounge - Adult Only? 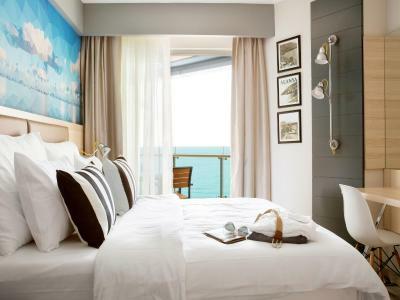 This twin/double room features a balcony, electric kettle and flat-screen TV. Sunprime C-Lounge is ready to serve you with elegant accompany of sun, sea, high comfort, modern architecture and Turkish hospitality. Our hotel is located at the pearl of Mediterranean Alanya, in the district of Oba. It is only 30 km from Gazipasa-Alanya airport, 130 km from Antalya airport. Alanya Centrum is 5 km from the hotel, and the district of Oba is around the corner, 500 m. Sunprime C-Lounge has 164 modern designed rooms. Our attentively designed standard rooms offer 2 single beds and couch that can also be used as an extrabed, safebox, air-co, telephone, free high speed wireless internet, iron, ironing board, kettle, Led TV with a satellite, rainshower. Well equipped Gym. Our luxury Spa and hamam are offering relaxing treatments to all body. Breakfast, lunch and dinner are being served in our Buffet restaurant with panoramic seaview. Easy access to the beach by underpass. House Rules Sunprime C-Lounge - Adult Only takes special requests – add in the next step! Sunprime C-Lounge - Adult Only accepts these cards and reserves the right to temporarily hold an amount prior to arrival. The drinks weren’t anything special. The entertainment was not the best, but I guess it was aimed towards the largely represented elder group. The territory of the hotel is small. A Little bit dirty rooms. If you are a coffee lover, you will suffer. The coffee is really bad. The drinks are not the highest quality, but they are unlimited. The management has changed since last year, I think that last year everything was much better and nicer. They were cleaning the rooms twice a day, this year was not the case anymore. The food was great.The staff so happy and helpful. The hotel was so so clean,and the entertainment was first class. Extremely responsive and kind staff!